Many Western commentators don’t understand Chinese views on income inequality. Given the grave threat these commentators believe economic inequality poses in China, why didn’t the subject make the list of “seven perils” in the now infamous Document 9, sent by CCP leadership to province and local officials this spring? The memo warns against “infiltration” of foreign ideology and institutions, such as constitutional democracy, universal values, civil society and freedom of the press. That the eight months since Document 9 was released has witnessed increased repression against human rights activists, media outlets foreign and domestic, and dissident academics suggests that the Party genuinely believes the “seven perils” threaten its staying power. Yet Document 9 made no mention of economic inequality. How can we explain the disconnect between commentators’ anticipation that economic inequality will undermine Chinese social stability, and CCP leaders’ disregard for the threat it ostensibly poses? Commentators are right to say that Chinese economic inequality is severe. As Deng foreshadowed when he observed that “some people must get rich first,” the reform period has created dramatic economic inequality. Between 1984 and 2002, China’s Gini coefficient nearly doubled, from 0.24 to 0.47. Economic inequality breaks down mostly across the urban-rural divide, and is largely attributable to CCP policy. CCP-created market distortions have artificially inflated urban real estate values, while it remains difficult to purchase land even in post-collectivized rural China. The abolishment of publicly funded university education in the 1990s has meant that it is affluent urbanites who have benefited from the boom in higher education. And in health care and pensions, both market and government options are superior for urban Chinese. Much anticipation of social instability thus naturally focuses on rural China. Yet systematic studies of political attitudes amongst rural, low-income Chinese reveal a fascinating twist: rural Chinese don’t seem particularly bothered by economic inequality. Based on interviews with 3,267 citizens across rural China, Martin King Whyte (Myth of the Social Volcano: Perceptions of Inequality and Distributive Justice in Contemporary China, Stanford University Press, 2010) argues that “farmers stand out as a group least likely to express critical and fatalistic views”of the Chinese economic system. How can this be? As it turns out that, when rural Chinese think about their standard of living, they compare it not to coastal China’s nouveau riche, but, instead to their family’s standard of living in the pre-reform period. So while it’s true that low-income rural farmers have not gained as much from the reform period as China’s business class, they gained far more than any other social constituency from escaping the Mao era. The reform period has created a highly unequal China, but the broad-based gains of the past three decades have inculcated a sense of optimism in Chinese of all class backgrounds. Whyte found that a majority of Chinese attribute inequality mainly to hard work and merit. More Chinese citizens believe that the economic system under which they live is fairer than its counterparts in Japan and both Western and Eastern Europe. Remarkably, only 28 percent of Chinese think that the values of socialism are violated by the inequalities of the reform period. And more Chinese than not believe there is no or little conflict between rich and poor, employers and employees, or urban and rural residents. The Hu-Wen vision of a “harmonious society” has been more successful than those whose views are informed solely by China’s Gini coefficient believe. Of course, China does not have to choose between the false dichotomy of Maoist-style collectivization or its current inegalitarian economy. CCP policies in taxation, health care, education, pensions, wages and migration can significantly reduce inequality. 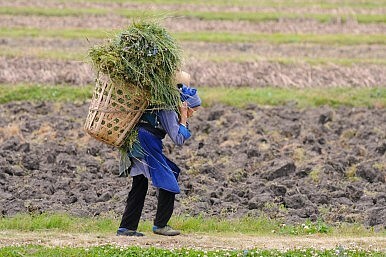 The policy released by the CCP in February – which aims to lift 50,000,000 Chinese out of poverty by increasing farmers’ incomes and easing rural to urban migration – should be lauded. These reforms have strong economic and moral justifications. But they are not imperative to avert the social unrest predicted too frequently in the Western academic and popular press. Believing otherwise merely muddles the attempts of Chinese activists to combat inequality, while offensively imputing to Chinese citizens views that do not reflect their genuine beliefs. That Document 9 considers denying the historic contributions of the CCP – but not income inequality – one of the “seven perils” strongly indicates that Party leaders have a far better pulse on their populace than many commentators possess. So long as even the poorest Chinese citizens continue to credit the CCP for the remarkable gains of the reform period, today’s current inegalitarian regime will be preferred to the shared impoverishment of rural Chinese in Maoist generations past. Sam Sussman’s academic research and political commentary on international relations has been published in the Tufts Journal of International Affairs, the Asia Times, the International Policy Digest, and the Oxford Left Review. The Casualties of China's Economic ReformsChina Lifts Ban on Lady GagaThe Chinese Dream: Still Dreaming?Double Trouble for ChinaWhat Are China’s Plans for its Airborne Corps?